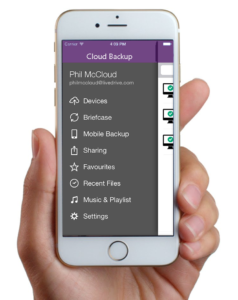 Our cloud backup makes it really easy to back up your photos, documents, music, videos and more. Simply install the software on your Windows or Mac computer and your data will automatically back up your files to our secure online storage. Our cloud backup gives you instant access to your backed up files, enabling you to download files, view photos and stream music and videos online at any time. Simply download our iOS, Android or Windows apps to securely access your files from anywhere. If disaster strikes and you lose a file due to a computer crash, theft or accidental deletion, you can easily restore your backed up files. The programme keeps up to 30 previous versions of files which makes sure any unwanted edits can be reverted quickly. If you want to back up a second computer or a NAS drive you can buy one of our great value add-ons. We also offer another product which enables you to back up your mobiles, tablets, and up to 5 PC or Mac users. Our cloud backup encrypts data during transfer and stores all backups in secure UK data centres.